The F973 19” LCD display solution features the latest in hardware and software technology. CTX’s new Digital True View technology combines Vivid Color, and Sharp-Cut Enhancement technologies with Multi-Gamma modes giving users customizable viewing experiences for text, graphics, sports cinema, or natural environments. Perfect for any lcd enclosure. 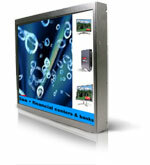 CTX all new high-performance LCD monitors with touch screen glass, and audio/DVI input available. CTX also offers LCD open frame kits and industrial PC solutions that can be applied to various monitor enclosure industrial applications.